Aissa Cantu, an English teacher at BETA, and Ana Villarreal, Spanish teacher, pack boxes with school supplies during South Texas ISD volunteering throughout the RGV as part of their development program on Friday, Aug. 17, 2018, in Pharr. PHARR — An assembly line of volunteers packing nonperishable food into mesh bags, cleaning and rearranging a gardening area, and packing school supplies, all for donation to the community, was in full-force Friday morning as the entire BETA team descended upon the Food Bank of the Rio Grande Valley. 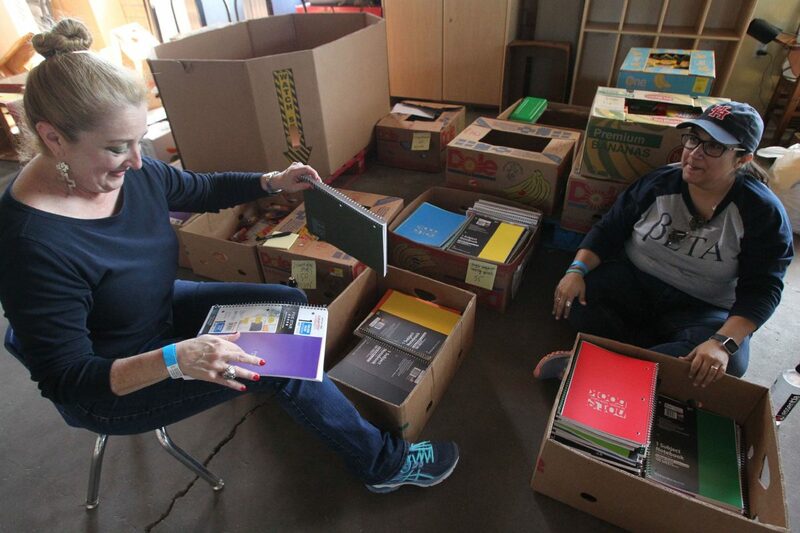 This is the first time that teachers and staff at South Texas ISD add volunteerism to their staff development activities, mainly as a team-building exercise. And all 58 teachers and staff from the Business Education and Technology Academy, known as BETA, chose to spend their time at the food bank helping in all capacities. Other schools also chose their own locations, the South Texas Preparatory Academy, for example, spread their teams throughout the Boys and Girls Club in Edinburg, Palm Valley Animal Center, PAWS animal shelter and the University of Texas Rio Grande Valley Food Pantry. Teachers from South Texas ISD BETA form a line as they prepare to sort bags at the RGV Food Bank on Friday, August,17, 2018, in Pharr. South Texas ISD teachers volunteered throughout the RGV as part of their development program. This is the first time they add volunteerism to the annual summer development. April Gonzalez, an English teacher from South Texas ISD BETA places bags filled with food at the RGV Food Bank on Friday, August,17, 2018, in Pharr. South Texas ISD teachers volunteered throughout the RGV as part of their development program. This is the first time they add volunteerism to the annual summer development. 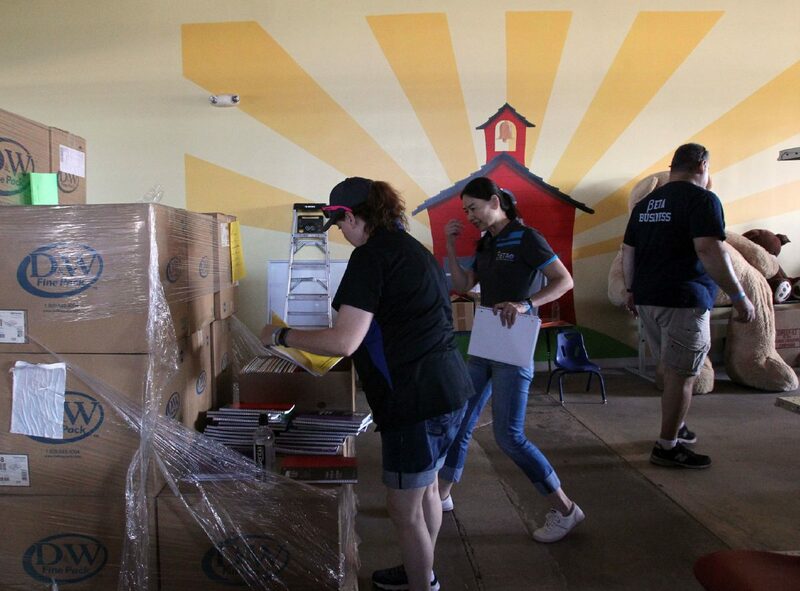 South Texas ISD teachers volunteered throughout the RGV as part of their development program shown here preparing back to school supplies at the RGV Food Bank on Friday, August,17, 2018, in Pharr. The BETA team thought of the food pantry and heard about the need for more volunteers due to recent floods, Garza said. South Texas ISD is based in Mercedes, one of the areas hardest-hit by the floods, but most students are bussed in every morning from all throughout the Valley. So the fact that the pantry highly impacts the community at large made it the perfect place for them, he added. The lessons learned through this initiative can easily relate to the classroom, said English Teacher April Gonzales as she looked at the bags filled with basic needs such as rice, beans, canned corn, salmon and fruit juices. 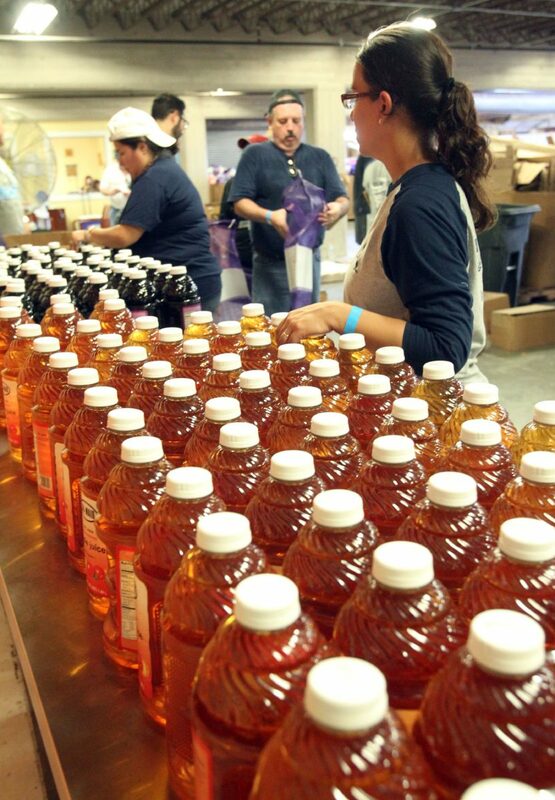 The food pantry is always happy to see volunteers as the full-time staff is limited, said Christopher Bueno, Gem Valley Farm manager, as they try to keep overhead cost at a minimum in order to have that money go towards food donations. Maintaining the garden, he said, is mainly done by a staff of three and volunteers that are interested in learning about the process. Some BETA staff, including the principal, took note on ways to remain involved with the food pantry as volunteers and having representative visit with the students. And as far as team building, some said this exercise was another way to reinforce the notion that they can all work together toward one goal. While at school, this goal is education; in the production line the goal turned out to be thousands of ready-to-go donations and a gardening space ready for the community to enjoy. And the way they powered through the heat inside and outside the warehouse was by making each other laugh as they worked.